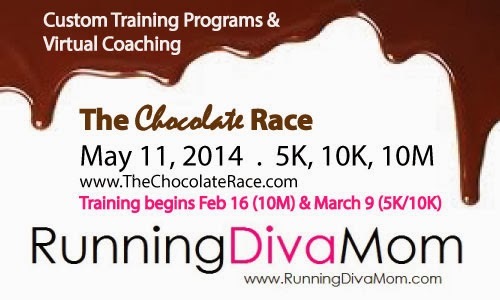 Are you running The Chocolate Race on May 11, 2014? and weekly virtual coaching for all three events! After turning double digits last month, Little Diva is now old enough to join me in the fitness center at the gym. We met with a trainer earlier this month and she can join me on the treadmill, elliptical and stationary bike. It is so much fun running along side her! She really enjoys the elliptical, which has made me step outside of MY comfort zone. I have always felt awkward on that piece of equipment and her enthusiasm made me stick-it-out a bit longer and now I actually enjoyed it. There is something that makes me smile each time I glance over at her and she is pushing the speed buttons up, up and up. Seeing her "in the zone" as she watches kid's programming on cable TV and listens to her earbuds. She doesn't even realize that she is exercising. And then we she run/walks a 14 minute mile, then a 13 minute mile - and yesterday, a 12 minute mile and brags about her accomplishments while she towels off. It makes me giggle inside (and out) each and every time. With lots of new training groups starting in the next couple of months, Little Dude and Little Diva have been frequently spotted helping me out around town. Whether we are making copies, running to the post office or gathering office supplies - they are always interested in what I'm doing and how I am helping people and meeting people. They both have their own interests and strengths and weaknesses, like any kid. So it's been fun having her help me organize and assemble packets and him help me make copies and operate the copy and postal machines. They may - or may not - be rewarded with ice cream and strawberry-banana smoothies after our "coaching errands". Have I always been a runner? No. I was actually an inactive, shy girl growing up. I was intimidated by trying out for sports or extracurricular activities. So, I didn’t. I was that kid that dreaded the mile and fitness tests in gym class. When I entered middle school, I struggled with self-esteem images and an eating disorder. I battled my weight throughout adolescence and beyond. My weight fluctuated with a weight loss support group for years. And, it wasn’t until after the birth of my first child, that I decided I had to do get active and balance eating well – and being active. I wanted a well-rounded, healthy lifestyle. The first step is the hardest. I watched a friend compete in Ironman Wisconsin in 2005 and I thought if he could swim, bike and run 140 miles – I could get myself off of the couch and run around the block. I looked up a couch to 5k program online and trained for my first 5K that fall. It became the one thing that I did for myself – and I enjoyed it. Nine months later, I ran my first half marathon. And, nine years later I have completed 45 half marathons and seven full marathons. Over the past three years, I have developed Running Diva Mom, a community for Madison-area women to get themselves off the couch and enter an active lifestyle. My gradual walk/run programs have given women a gentle introduction to running. It’s been amazing watching these women transform their bodies, minds – and wardrobes – during a short nine weeks. When they enter the couch to 5K program they think that it is impossible to run three miles, but I prove to them, with a little commitment that they are capable of doing anything. It’s been amazing sharing my passion with others. Still think you can’t run? Well, maybe you should reconsider. Running can be a great social activity. It’s a great way to reconnect with your girlfriends or your spouse. These can be great mini dates. 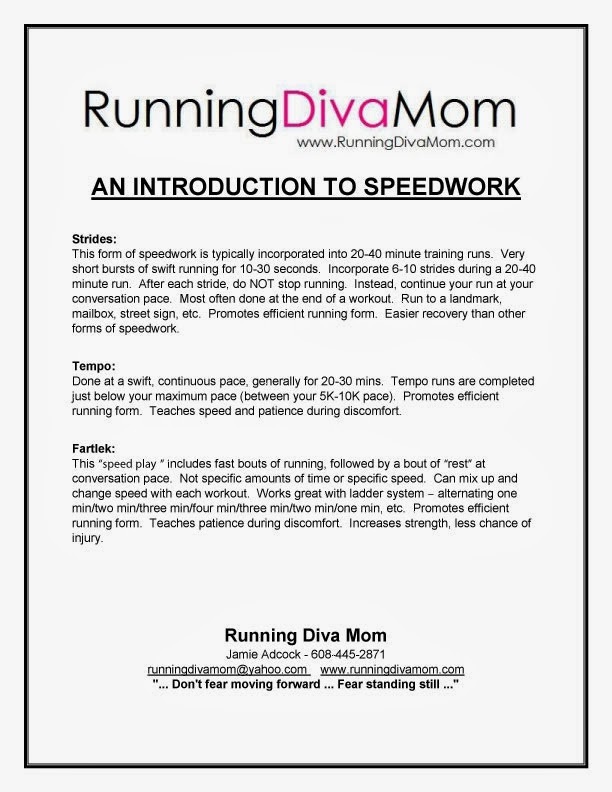 It’s also a great way to meet new friends through running groups, like Running Diva Mom. It’s a great calorie burner. You can burn approximately 11 calories/min running vs 5 calories/min walking alone. When you are running solo, it can be great time to be alone with your thoughts. A morning runner can plan their day and review to do lists in their head. An evening runner can clear their mind and remove frustration from their day. Running can be a pretty affordable form of exercise. If you are a recreational runner, your solo investment is only a good pair of running shoes. Explore your community. Running paths are everywhere. Running is a great way to explore your hometown and discover new neighborhoods, businesses and parks for your family to visit. You can literally run anywhere. There is never an excuse to skip a workout. You can use a treadmill, run laps around the soccer field, run in place with your kids and the wii and explore new places on vacation. And remember – Don’t fear moving forward. Fear standing still. Did you already run a 5K and are ready for more? 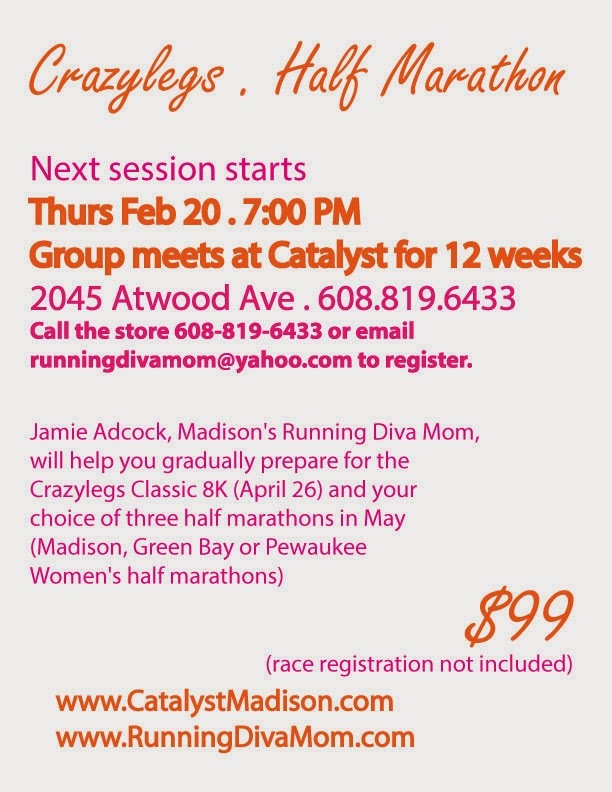 Running Diva Mom is starting her next longer distance group at Catalyst on February 20! This group will be training for the Crazylegs Classic 8K (5 miles) in Madison, WI on April 26. This group will also be training for your choice of several May half marathons in Wisconsin. Some members are opting to train for a 10K (6.2 miles) instead of the half marathon distance. All paces and abilities welcome!!! The latest Running Diva Mom couch to 5k group crossed the finish line this afternoon. 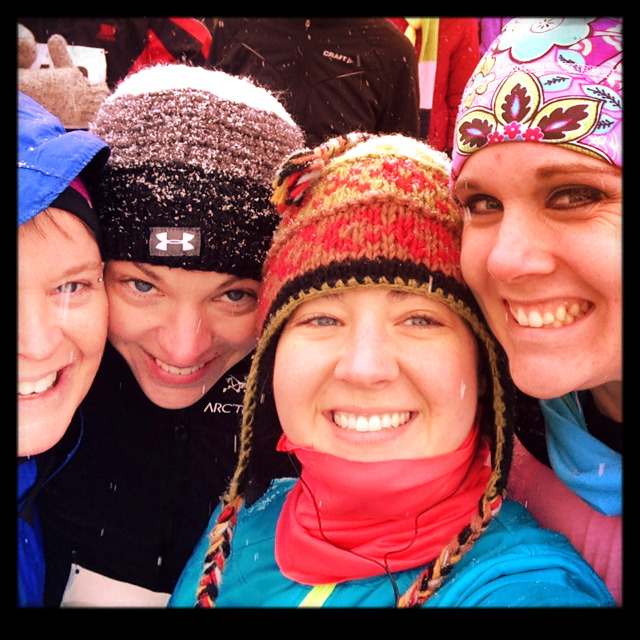 They have been training at Catalyst for the past few months and ran the Freeze for Food 5K today - snow and all! We had a difficult couple of months with one of the coldest winter's in history. We also had a two week break from class over the holidays. But, they stuck with it. These ladies made it!! The snow was coming down as we were bundled layer upon layer at the start line. They ran the entire 5K at Vilas Park - no walking. They even conquered that hill near Edgewood College, too. The route was great and a nice out-and-back course. It was a different route than the other races I've ran at Vilas Park. I love out and back courses - especially for groups - as they can retrace their steps to the finish line. These ladies are absolutely amazing!! And I feel so privileged to have crossed paths (literally!). Congratulations - Tina, Andrea and Beth!! I don't have many regrets in life. Most obstacles are life lessons. Most failures are opportunities to improve. I just wish that I had discovered running - or something like it - earlier in life. I wish I hadn't been so shy as a kid; would have tried out for sports and would have developed a passion for something sooner. It's taught me to set goals, step outside of my comfort zone, that it's OK to be uncomfortable, risks are ok, change is good and that it's ok to do something for me. Even though I didn't discover running early on in life .... I really feel that I found it at a pivotal point in my life - when I needed it. How old were you when you discovered running? Did it help you through a difficult time?? The kids always love The Fox and Cups. Mom always loves Roar and Clarity. Enter now though January 19. 40,000 sq feet of Exhibitor Space! Huge Raffle and tons of Giveaways!! 60 + Exhibitors all about fitness! 5k + 10k + kids race on Sunday! I look forward to participating in the Expo Run 10K on Sunday morning and attending the GLM Expo with my family. You can stop by and meet me at the Women Run Pewaukee Half Marathon booth from 10:30-11:30 on Sunday at the Expo!!! I look forward to serving as an ambassador for this fun event for the ladies!! The Expo Run 5k / 10K and Kid's Run. This is race #4 in the 6 race Great Lakes Winter Run Series. Post race food and drink are provided. ALL GLM WINTER SERIES RACES PROVIDE INDOOR FACILITIES FOR OUR ATHLETES TO STAY WARM AND DRY UNTIL THE START OF THE EVENT. REGISTER BEFORE FRIDAY 1/17/14 TO GUARANTEE YOUR CUSTOM BIB AND RACE DAY SHIRT!! $30.00 until 1/28. $35.00 after 1/28. All expo runners receive free entry into the expo!! 5 – Post about this giveaway on your blog, Facebook or Twitter (@RunningDivaMom @GLMultisport #RunningDivaMom) account. LEAVE ME A COMMENT FOR EACH. Call the store or email runningdivamom@yahoo.com to register. This form of speedwork is typically incorporated into 20-40 minute training runs. Very short bursts of swift running for 10-30 seconds. Incorporate 6-10 strides during a 20-40 minute run. After each stride, do NOT stop running. Instead, continue your run at your conversation pace. Most often done at the end of a workout. Run to a landmark, mailbox, street sign, etc. Promotes efficient running form. Easier recovery than other forms of speedwork. Done at a swift, continuous pace, generally for 20-30 mins. Tempo runs are completed just below your maximum pace (between your 5K-10K pace). Promotes efficient running form. Teaches speed and patience during discomfort. This “speed play” includes fast bouts of running, followed by a bout of “rest” at conversation pace. Not specific amounts of time or specific speed. Can mix up and change speed with each workout. Works great with ladder system – alternating one min/two min/three min/four min/three min/two min/one min, etc. Promotes efficient running form. Teaches patience during discomfort. Increases strength, less chance of injury. I was lucky enough to come across the BeFAST Sportgear booth at the Madison Marathon expo in November. They were selling some adorable headbands - and super comfy, winter hats for athletes. It looks like they weren't only popular with runners, but also with downhill and cross-country skiers. All of their headbands and their hats come in these bright and bold patterns - and most even match. They have rainbow prints, animal prints, sparkly prints and much more. They are also available in solid colors, for those of you that aren't quite so over-the-top; as well as some great patterns for men. The AllSport Headbands are intended for various sports and activities - all year round. Keeps hair out of your face. The WinterSport Headbands are intended for winter sports and/or winter running. Provides excellent warmth for any outdoor sport. I was sent a Sport Hat in a fun rainbow print. I love this thing. It' just makes me happy! And it's always a conversation piece. It's bright and I stand out (even during dark runs!). Even better - it keeps my noggin warm and cozy. The design and the fabric chosen, provides just enough warmth in and lets the sweat out. Antimicrobial liner at the ear band. 5 – Post about this giveaway on your blog, Facebook or Twitter (@RunningDivaMom @BeFASTSportgear #RunningDivaMom) account. LEAVE ME A COMMENT FOR EACH. Insoles & Beyond offers insoles for all of your needs - including arch support insoles, orthotics for flat feet, and inserts for plantar fasciitis and more. They also offer some very competitive prices on their site. I love how you can shop by BRAND or by NEED on their website - very helpful. Insoles & Beyond is a family-owned company and realizes that foot health impacts the quality of life - especially for athletes. Insoles and Beyond is here to help you find solutions to your foot pain, whether you need arch support inserts to relieve ankle and knee pain, running shoe insoles to get rid of shin splints, or plantar fasciitis insoles so that you don’t wake up with heel pain again. They offer a variety of insoles for running. They suggest the currexSole RunPros or the Sof Sole Fit for runners. I've used insoles on and off over the years - and had good experiences and bad experiences. Usually they just seem to add "bulk" to my running shoe and leave me less room in my pair of running shoes. These felt great, though I'm not sure I would use them for every run. They cushioned and cradled my foot, and didn't add too much bulk. Although, my shoe felt a little bulkier than normal - and my footstrike did feel different (like is supposed to!). I look forward to trying them out on some longer training runs this spring. I felt like they added a serious bounce to my step. 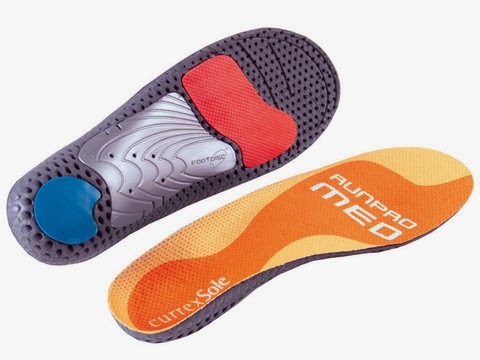 The award winning currexSole RUNPRO is the ultimate performance insole for running, walking or triathlon. Wear it in classic running shoes or let ‘em help you to step forward into minimalistic shoes. 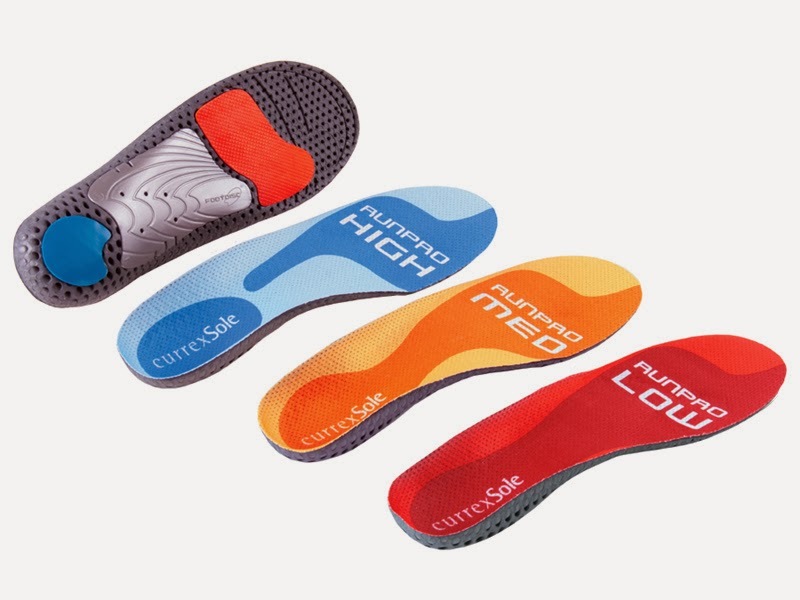 Every CurrexSole insole model comes in three variations - high, medium, and low. Whether you need orthotics for flat feet, insoles for low, neutral or high arches, are a overpronator or supinator, currexSole's Dynamic Arch Technology will cradle your arch, distribute pressure evenly, absorb energy upon impact and release energy like a spring upon launch. Not every foot is created the same. CurrexSole has something for every athlete. Replace the foam inserts with better insoles for running. One of the most common requests we get is for advice on insoles for running shoes. If you have been a runner for any length of time, you have probably realized – or been told – that you will need to replace the foam insoles that come in your running shoes with better insoles for running. It’s important to start with the best running shoes you can afford, but don’t stop there. Investing in a good set of running shoe insoles isn’t a luxury – it’s an absolute must for your health. Insoles for running shoes are important during high impact activities. The importance of running insoles can’t be understated. The human foot has 26 bones, all fitting together almost like a puzzle in a series of plates and joints that work together with tendons and ligaments to create a fully faceted piece of biomechanical awesomeness. Think about all the different ways your feet can move, bend, stretch, grip, tighten, flatten, and adjust. One of the most remarkable attributes of the foot’s structural makeup is the arch, which is what allows the foot to do so much of what it does. Protecting the arch, especially during high-impact activity, is critical for short- and long-term foot health. Consider running insoles for plantar fasciitis. Runners can often experience a painful condition known as plantar fasciitis. A great way to combat plantar fasciitis is with arch support, which all of our running shoe insoles provide. Save yourself significant amounts of pain and medical expense with the simple purchase of a running insoles for plantar fasciitis. Get your running shoe insoles before you pound the pavement. High-impact athletics are sometimes called “pounding the pavement,” and they get that moniker for a reason. Running (as well as related activities like jumping and skipping) puts a lot of pressure on various points of the foot, requiring it to move and adjust at a rapid pace. When the delicate structure of the arch isn’t supported correctly, the heel isn’t stabilized, and alignment isn’t achieved, you aren’t just risking pain and injury – you are virtually guaranteeing it. Protect your feet with insoles that provide the right amount of stability, arch support, shock absorption, and cushioning. Need help Finding your arch type?? Use this easy and interactive tutorial and video, using a plain piece of paper. 5 – Post about this giveaway on your blog, Facebook or Twitter (@RunningDivaMom @InsolesNBeyond #RunningDivaMom) account. LEAVE ME A COMMENT FOR EACH. Enter now though January 14. I was sent a copy of the Blogger Babes Manual: An Introduction to Blogging this fall. I've been slowly sifting through the pages over the past few months to dig deeper into the world of blogging, why it works, why it sometimes doesn't work - and what I need to know as I set off to pursue Running Diva Mom full-time. Heidi Nazarudin wrote this e-book (I was sent a hard copy), that explores the in’s and out’s that beginner bloggers need to know in order to get a blog going, stick with it, and truly make it a success. With making blogging a job, this “how-to” manual will guide bloggers to success. The e-book is complimentary to Blogger Babes members and is available on Heidi and Co. or The Blogger Babes website and for non-members on Amazon and iTunes for $14.99. Heidi constantly touches on sticking with your vision and your priorities throughout the book. It's a difficult to find a balance of staying on top of things, constantly publishing new content, overwhelming readers, and balancing your personal life. Nazarudin stresses the importance of bloggers keeping blog posts fresh and putting their fresh spin on the things other people are talking about. Nazarudin also writes about an important part of blogging that many can easily forget about; interacting with readers. This is definitely something that I admit that I've been struggling to find time with. But I've learned that I will have to make the time to do this to succeed. And I feel that I will also find the interaction very rewarding - for both sides of the ocnversation.. She teaches how to do this effectively for the benefit of both the blogger and the reader. One thing that I have tried to do - and will continue to do - is learn to say no and set boundaries. It is difficulty working and it can be even more challenging to work from home. Heidi reminds readers to set boundaries and balance your career, your personal needs, your kids, your spouse, your interest, your home - and your blog. Learning to say no to projects can be difficult - but it can also be very freeing once you say no to things that don't relate to your vision, especially if it doesn't bring you and others around you higher and happier. 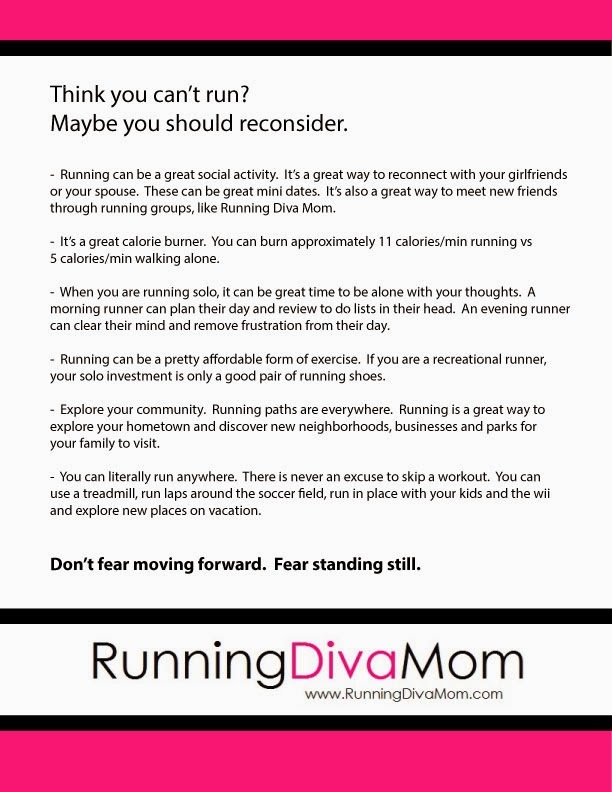 I look forward to using many of Heidi's tips for being a female blogger with Running Diva Mom in 2014 - and beyond. 5 – Post about this giveaway on your blog, Facebook or Twitter (@RunningDivaMom @TheBloggerBabes #RunningDivaMom) account. LEAVE ME A COMMENT FOR EACH. Enter now though January 12. Action Wipes, is a favorite among travelers and fitness enthusiasts. I reviewed these a few years ago, but was excited to try them out again. These portable wipes are eucalyptus and tea tree oil infused, full body, natural wet wipes that provide an instant shower whenever & wherever you need one. The proprietary wipe potion creates mild suds that don't require rinsing and are quick to dry - leaving your skin clean & refreshed (not sticky) after gym workouts and long runs. The 30 soft sheet pack sells for $24.99. This package contains 30 Action Wipes in a soft, pop-up package with a snap shut lid. Convenient to keep in your gym bag, locker, car, desk... you name it. You can also purchase 30 large singles for $29.97. At still less than $1/wipe, you'll receive the same size wipe in smaller, individual packets. These are a little more portable and a lot lighter. Think of these for big events, post-race bags, or hand one to your support crew for post-event sweatiness. These wipes are a great size and super convenient. If you are running a race, you can just put them in your post-race bag and grab a wipe immediately after you hit the finish line. They are large enough to towel off and cleanse your entire body - and leave you feeling refreshed. You don't feel sticky and there is no film left on your body. They simply get rid of all of the stink, the sweat, the good ole disable effort left behind after a workout. You can immediately get rid of that griddy, white salt on your face and body after a marathon. And you can enjoy that post-race meal with friends and family, feeling a little bit better about yourself. 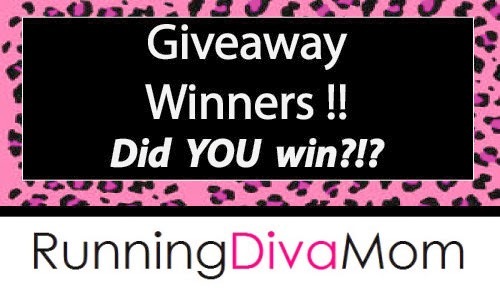 5 – Post about this giveaway on your blog, Facebook or Twitter (@RunningDivaMom @actionwipes #RunningDivaMom) account. LEAVE ME A COMMENT FOR EACH. Enter now through January 11.